Do I Hate My Country? I've several times been accused of hating my country with the accompanying suggestion to move, but this is plain and simply a false accusation. That people would infer as much by my opposition to my [many layers of] government is a testament to just how badly people have been educated regarding the state and society. I want to be perfectly clear, I absolutely love my country. I love our genius and our ingenuity. I love our passion and our charity. I love most of everything there is to love about my country. HOWEVER, I don't confuse "my country" with "my government" or "my nation". 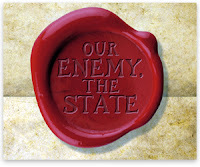 In fact, I see, as Albert Jay Nock wrote, that the state is the greatest enemy of mankind. That is, my government is my country's public enemy number ONE. I take Christ's commandment to love our neighbor as ourselves seriously, which is why I not only want bad government (though I repeat myself) out of my life, but also out of my neighbors'. I want liberty and freedom as much for my fellow countrymen as much as I want it for myself and my family. This is the very reason I am so open about what I believe, and try to share all I can via my website and social networking on the principles of liberty, so that my neighbors may understand as I do the face of our common enemy. I love my country very much, but I don't make the dangerous mistake of confusing my country with my country's government.